"No art worth a damn was ever created out of happiness, I can tell you that much." Netflix has debuted the trailer for an indie titled Kodachrome, which premiered at the Toronto Film Festival last year. Based on an article by A.G. Sulzberger, the film is about a father and son who take a road trip to Kansas in order to develop photos at Kodak's last Kodachrome lab before it closes its doors forever. It's set during the final days of the admired photo development system known as Kodachrome, with production finishing in 2010. This is clearly a love letter to the art of film and developing film and the days of film, but wrapped around the engaging story of a fun road trip. Kodachrome stars Jason Sudeikis, Ed Harris, Elizabeth Olsen, Wendy Crewson, Bruce Greenwood, and Dennis Haysbert. This looks quite good, it's worth a watch. Matt Ryder (Sudeikis) is convinced to drive his estranged and dying father Benjamin Ryder (Harris) cross country to deliver four old rolls of Kodachrome film to the last lab in the world that can develop them before it shuts down for good. Along with Ben’s nurse Zooey (Olsen), the three navigate a world changing from analog to digital while trying to put the past behind them. Kodachrome is directed by Canadian producer/filmmaker Mark Raso, of the film Copenhagen previously, as well as a few shorts. The screenplay is written by Jonathan Tropper, based on an article by A.G. Sulzberger. This first premiered at the Toronto Film Festival last year. 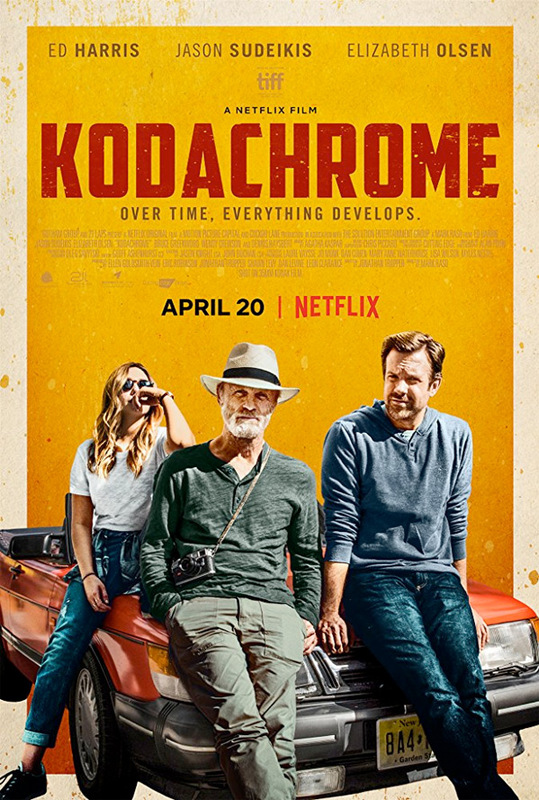 Netflix releases Kodachrome streaming exclusively starting April 20th this spring.